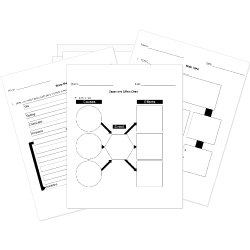 You can create printable tests and worksheets from these Grade 8 Character Study questions! Select one or more questions using the checkboxes above each question. Then click the add selected questions to a test button before moving to another page. All main characters are protagonists. Which is NOT an example of a character trait? This is a character who experiences a significant change or development over the course of the narrative. I was sitting there, smoking a cigarette, when Jerry came back in from making a phone call. He stared at me for a second. "It can't rain! If it's rainy my hair gets puffy and droopy." Jenny slipped into the restroom as soon as the bell rang. She dabbed at her eyeliner with a paper towel, removing a tiny smudge. Next was just a hint of lip gloss. Finally she flipped her hair upside down and fluffed it up. After one more glance in the mirror, she stood in the doorway, waiting for just the right moment... and there it was. Frank was just coming out of his English class. Perfect timing. What might Jenny's motivation be in this passage? She is afraid of a bully. She is avoiding a teacher. She wants to be on time to class. She wants to impress Frank. Which of the following character traits could be used to describe Jenny? "I don't really know. I just know that you better stay away from places where you might be caught alone, like bathrooms." What is it called when a reader has to infer what the character is like based on what he says, thinks, or does? Ivan's legs felt like rubber. The more he tried to stand straight, the more they wobbled. He felt like he was standing on a mountain of spaghetti. If he moved just an inch, the Sarge would yell at him. But his legs continued to shake and rattle like window panes in a tornado. It was almost the end of another hard day at the cadet school. All of the other cadets were exhausted and wanted to sleep. After dinner, they were told to stand and had been standing in place for the last hour. Ivan wondered how long he'd have to keep standing. He counted the days since he had joined the army, and it had only been seven. Ivan had enlisted because he wanted to show his mother he would be the best soldier in the entire Russian army. He could feel the creaking of the barrack floors. It was like the world was pushing through beneath him, but he stood still. Suddenly, the Sergeant broke through the barrack's doors. "Don't move!. Don't move!" was the only thing Ivan could think of while the Sarge stopped in front of him. "WHERE ARE YOU FROM, CADET?!" he yelled at Ivan. "SIR, Siberia, SIR!" he responded as he was taught to do. He could not afford to make any mistakes or show any weakness. "WHAT'S IN SIBERIA, PRIVATE?!" the Sarge yelled, even louder this time. Ivan knew that the purpose was only to frighten him, so he wouldn't be scared. Even so, the only words he could say were few. "SIR, eh!?!. Snow, SIR!?!" He could feel his "comrades" laughing but also their fear from expressing it. "IS THERE NOTHING MORE THAN SNOW IN SIBERIA?!" "SIR, forests, SIR!?!" he said with a frightened voice. . .
"DO YOU LOVE TREES OR SOMETHING?!" the Sarge barked. Just when Ivan felt a tear in his right eye, another kid saved him. Ivan's comrade just could not stand there without laughing and started to giggle. The Sarge ran over to the other side of the long barrack and yelled, "YOU THOUGHT THAT WAS FUNNY?!" He stopped and inspected the cadets. "SINCE THIS PRIVATE LOVES COMEDY SO MUCH, I HAVE ANOTHER JOKE FOR ALL OF YOU...50 LAPS AROUND THE BARRACKS! NOW MOVE, MOVE, MOVE!" "But his legs continued to shake and rattle like window panes in a tornado." What is the effect of the imagery the author uses in this description? It shows there is a storm coming. It shows that Ivan is out of shape. It shows that Ivan is well-prepared. It shows how terrified Ivan felt. A is one-sided and often stereotypical. "She struggled, searching for air, for land, for something to hold on to. But there was only the water, pulling her into its depths." A is fully developed and exhibits many traits-often both faults and virtues. An takes place within the mind of a character. The character struggles to make a decision, take an action or overcome a feeling. is the act of creating and developing a character. An is one in which a character struggles against some outside force, such as another person. A is one who does not change. is the act of creating and developing a a character whereby at the author depends on the reader to draw conclusions about the character's traits. Sometimes, the writer tells what other participants in the story say and think about the character. A is one who changes or grows during the course of the work. is the act of creating and developing a character whereby the author states the character's traits or characteristics.